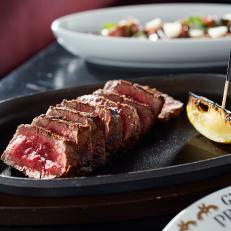 Although it bills itself as a steakhouse, GT Prime is really more like a fine-dining restaurant that just happens to also serve top-shelf meat. You won’t find 2-pound hunks of rib eye; instead, reasonable 4-ounce portions of top-class wagyu strip steak or grass-fed bison already cut for you are on offer. Supplement those manageable portions with airy arancini puffs dripping with mortadella-spiked cheese fondue and creamy risotto rice, or opt for tangles of bigoli fortified with beef, pork and veal-enriched Bolognese sauce. Prices are reasonable, relative to old-school spots, which means your stomach, wallet and clients will all be happy.